Let’s start the New Year with some star power, shall we? Today for your listening pleasure, we have first-rate efforts from Blake, Miranda, Lady A, Ronnie Dunn and Tim McGraw. Tim definitely has the ballad of the day. Our newcomers are Jana Kramer, Tim Dugger and Ann Claire. Wait a minute, Tim had a record out back in 2009. So that leaves Jana Kramer as our DisCovery Award winner. 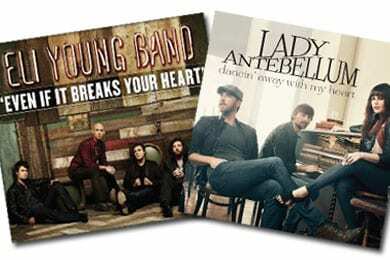 The Disc of the Day prize is a tie between two of our band entries, Lady Antebellum and Eli Young Band. Long may they sing. Here’s to a prosperous, healthy and happy 2012 to one and all. —Majestic. It has a melody to get lost in and production dynamics that pound and swirl. The lyric is for aspiring musicians everywhere. I’m way, way into this anthem. —Individually, their voices are enchanting. But when these kids harmonize, magic happens. This wafts through the room’s atmosphere like incense smoke. In a word, dreamy. —Loaded with fiddle and steel, this wobbles and weaves its merry way to the barroom. Lotsa sing-along hillbilly fun. —The lovelorn redneck is drowning his sorrows, and the band is rollicking. —The man in this ballad is far from perfect, and he knows it. He’s cleaning up his act, little by little. Movingly performed and beautifully written. —It’s a heartache lyric wrapped up in a jaunty, country-pop arrangement. It may not be a hit, but it certainly shows promise. —This trembling ode to loss has a deeply contemplative vibe, but the track packs enough energy to keep it from being completely mournful. Miranda’s vocal, as usual, is perfect. Writer: Jon Randall/Jessi Alexander/Rodney Clawson; Producer: Scott Hendricks; Publisher: Reynsong/Why Ya Say/Vistaville/Happy Tears/Big Red Toe/Amarillo Sky, BMI/ASCAP; Warner Bros.
—He’s such a fine country singer, and this swaying, honky-tonk come-on fits him like a glove. Winning in the extreme. —She’s some kind of princess in Iran, since she’s the niece of the late Shah. Hence, her CD title, Honkytonk Princess. Its debut single isn’t a honky-tonk tune, however. It’s a sunny, bright, upbeat bopper. Her breezy soprano vocal delivery is adequate, if unexceptional. —Captivating. Every instrumental break, every vocal lick and every thing about this production is crystal acoustic perfection. And it doesn’t hurt that the song is such an evocative minor masterpiece.